Thank you so much to NetGalley for providing me with an eARC of A Curse so Dark and Lonely. This in no way impacted my thoughts or feelings of this book. Have you ever read a book that you enjoyed but not something you’d scream to the world? Just a mediocre book. On top of the book being mediocre, it seems that everyone seems to absolutely adore this book and it was just flat for you? Well, that is me with A Curse So Dark and Lonely, unfortunately. I absolutely adored this author’s Letters to the Lost series but this one…nothing. I felt nothing for these characters nor did I even want them to succeed. It all felt like such a waste of my time. Especially considering this book dragged. This was just incredibly underwhelming. The hype may be something that absolutely destroys this one. Also the fact that Beauty and the Beast retellings are getting quite boring. Not only that but just how messed up the story of Beauty and the Beast is. The whole concept of being kidnapped and then falling in love with the reason you were kidnapped just seems fucked. I know Stockholm Syndrome is real and it happens, but like, this ideal needs to stop honestly. A Curse So Dark and Lonely follows a dual perspective of Rhen and Harper. Harper is from a modern society similar to own. It is unfortunately not a good life she lives. Her mother is dying from cancer and doesn’t have long left. Her father left the family after racking up an astronomical debt with the wrong people. Harper’s older brother is now doing his best to keep these people off the families back, but the things he’s doing is not exactly ethical. Harper also has Cerebral Palsy, which is something that plays a small part in this novel. On the opposite side of the coin, in a whole other world, Rhen battles against himself. He has been cursed for hundreds of years and has murdered almost everyone he loves. The only way to break the curse is to have someone fall in love with him. His guard, Grey, can go over to Harper’s world for an hour each new season and takes a new girl each season in order to find someone for Rhen to fall in love with. The pair is thrown together in an absolute whirlwind. Harper is different from the other girls (yikes) she is fighting against the kidnapping and the idea that she is meant to fall in love with Rhen. The characters slowly build up a friendship over the kingdom of Emberfell. I saw someone say that this book was enemies-to-lovers but I really didn’t feel that. This story didn’t really have too much hatred or waring between the characters. Harper pretty quickly relents her hatred for Rhen. 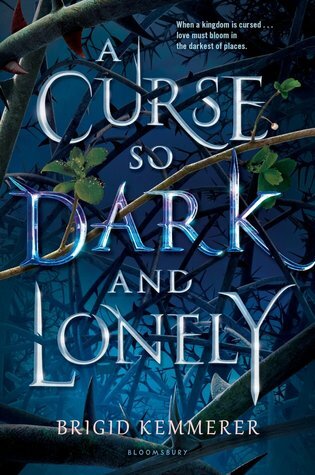 Unfortunately, I was pretty disappointed by A Curse So Dark and Lonely by Brigid Kemmerer. The whole story felt quite one-dimensional. The characters were flat and the whole story that just felt bland. I would compare this book to An Enchantment of Ravens, if you want to see my review for that one click here. The world building itself is never really explained. It is briefly mentioned in the beginning but it was incredibly confusing. I feel if you’re writing an urban fantasy one needs to really make sure both worlds are incredibly solid and believable. I think one of my biggest problems with this novel was that Harper completely forgets her family at one stage. Her family that is struggling immensely and in which she has suddenly disappeared from. In a part of this book, she even states that she was forgetting them. It was just incredibly frustrating. I didn’t understand why Harper, whose family was her entire life, would suddenly start forgetting them in favour for an unknown world and people. This story was also incredibly predictable. The characters were incredibly easy to read. They basically fit exact stereotypes and when the ‘twist’ was revealed in the last chapter I was not impressed at all. It was all just so bland. The characters were just so damn boring and the storyline didn’t help that – even though it was a heavily political based story which can typically be quite interesting. I also didn’t enjoy the romance between Rhen and Harper. I would have enjoyed it more if it was between Grey and Harper – which was hinted at one stage and it was so damn strange? Grey and Harper definitely felt more like an enemies-to-lovers plot line and the connection between them wasn’t forced in the same way that Rhen and Harper were. Wow, I just realised how much I really didn’t enjoy this book. I really thought I had enjoyed it more than this but it seems it was just an overwhelming letdown. Overall, for me, A Curse So Dark and Lonely by Brigid Kemmerer was a disappointing read. It is definitely not worth the hype. I truly think that this is going to be one of those books that the hype absolutely destroys. I am an affiliate for both Book Depository (INTL) & Booktopia (AUS & NZ). Using my links gives me a 5% commission from your order at no expense to you. I would love if you chose to use my affiliate links to shop at these stores! Click on the links provided here to shop. My Book Depository ID – what you add to the end of a URL – is AMBSBLOGREADS. I’m sorry you didn’t enjoy this! I’ve been seeing so many good things about this book and I want to pick it up at some point to see what I think because I love Beauty and the Beast retellings, so I hope the hype doesn’t have my expectations too high!